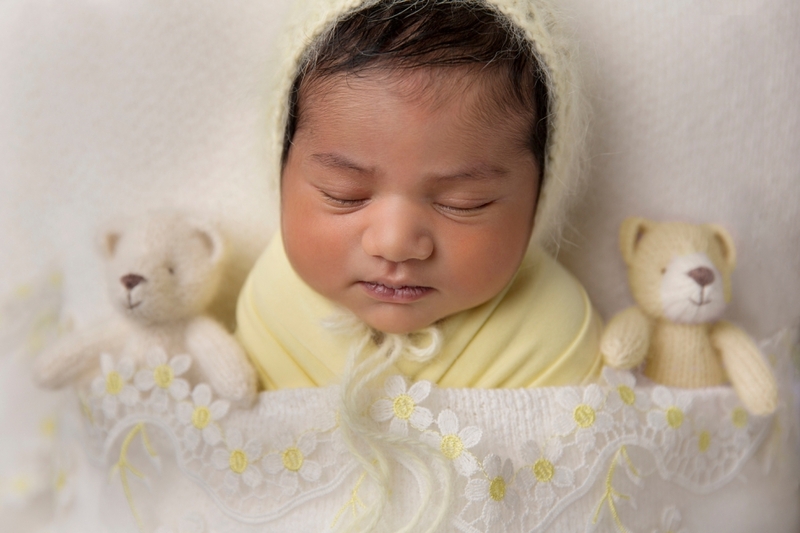 It is best to have your newborn session when your baby is 5 to 14 days old. Newborn style sessions are possible with babies 2 – 4 weeks old but it is generally much harder, and sometimes not possible, to get the sleepy, curled up photos that are possible with younger babies. It best is to book while you are still pregnant and once your baby arrives we can finalise a date and time. I can only take a limited number of bookings each month, so please book early. Newborn sessions take place in my home studio in Geebung. You can relax and enjoy watching your baby’s first photo session. I have a large range of props in colours and textures from neutral and natural through to bold and colourful for you to chose from. My props are source from all of over the world and are hand made using high quality materials. If you have items with special meaning to you these can be included in the photo session. Your baby’s safety is of utmost importance. I do not use props or poses that put your baby at risk of harm. As baby generally naked or lightly wrapped clothing during their session my studio is heated so that they are nice and cosy. I allow up to 3 hours for newborn sessions. This gives baby plenty of time for feeds and cuddles as required. The session is guided by your baby’s needs. As well as capturing images of your newborn I like to take some photographs of you and your partner with your baby as well as any older siblings. All blankets, wraps etc that are used during newborn sessions are washed after use to ensure they are safe and hygienic for your baby. Prior to your session I will discuss colour and prop preferences with you. After you session I processing and edit the best 25 images from your session and create a password protected on-line gallery for you to view your images and to place an ordering. You receive your gallery link and password generally 7-10 days after your session. To secure your booking your session fee, of $100, is required to be paid and your booking form, including my terms and conditions, completed online. Your session fee is non-refundable but if you are unable to attend your session at the booked time I am happy to reschedule at a mutually convenient time. The session fee does not include prints or digital products. High quality printed and digital products are available to purchase. Fine Art Prints start at $30 and Digital Packages start at $850. There is a minimum spend requirement of $800.